Facebook has been testing a trending feature similar to Twitter’s trending topics, but the social network announced Thursday that it will start rolling it out for users in the U.S., U.K., Canada, India and Australia. This may not be available immediately and is a roll-out. On the top right corner of News Feed, Facebook will show trending topics based on popular conversations happening around the social network. Users can then click the topic to see public and friends’ posts about that topic. A Facebook spokesperson noted that trends are identified by “an algorithm that highlights topics that have had a sharp increase in popularity, as opposed to overall volume.” Trends cannot be sponsored at this time, but this could be a source of revenue for Facebook in the future, much like how brands pay to promote topics on Twitter. 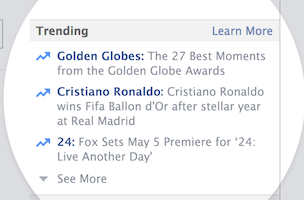 Users can click “see more” for a full list of trends buzzing on Facebook. The site also includes something that Twitter doesn’t: a description of why that particular term is trending. When a user clicks on the trending item, they’ll see posts from friends, pages, news organizations, celebrities and public figures. Posts from pages the user has liked, friends and people they’re following will show up higher in the feed. Facebook notes that while they’re rolling this out for desktop in the select countries, they’re still testing it on mobile. Readers: What do you think of this move?